You might be in port for less than five hours or nearly two full days, with an average stay of about eight hours. Some passengers choose to explore on their own, as the ports are usually loaded with dining and shopping options. To maximize time, other passengers book shore excursions through the cruise line. They might take leisurely sightseeing bus tours or adventurous snorkeling and horseback riding trips. While you can book through a local provider, "The Los Angeles Times" says booking through the ship ensures that your provider has been vetted and will get you back to the ship before departure. These excursions cost extra, but contribute to a hassle-free vacation. While cruises boast "all-inclusive rates," beware of extra expenses. Please be aware that there are additional fees for fitness classes, specialty restaurants, bottled water, soda, alcohol, fancy lattes, spa treatments and tips. Some ships include an automatic gratuity in their rates, but it's standard practice to bring a few extra dollars to reward exceptional service. To get a cruise bargain, Absolute Dream Vacations recommends cruising during the off-season. Budget conscious travelers should avoid spring break and summer months, which have bigger crowds and higher prices. Great deals can be found with hurricane/rainy season voyages and re-positioning cruises or just by calling one of our cruise specialists at Absolute Dream Vacations. Absolute Dream Vacations recommends driving to the pier or booking air travel to arrive no later than noon on embarkation day, but preferably the day before. Be sure you have a valid passport, photo ID and any necessary paperwork filled out before departing. Look up your cruise line's dress code, which range from "resort casual" with khakis and skirts to "casual" with polo shirts and tank tops to formal with suit jackets and evening gowns. Keep in mind that seasickness happens to the best of us, so it's wise to bring a magnetic wristband or motion sickness pills in your carry-on. We recommend booking 6 months or more. Booking in advance allows you first selection of the better staterooms and location of staterooms. Once on board, you might find your room to be very small unless you opted for a more spacious balcony suite. State rooms usually come equipped with outlets, but no DVD players or alarm clocks. In your room, you'll find a schedule of entertainment events that might include Broadway-style shows, movies, games, comedy shows, dances, educational seminars and tours. For dinner, some cruise lines offer traditional fixed-seating, which means you'll be at a table with several other couples at a set time in a large room. Cruise lines like Princess and NCL offer a larger window of time for dining and the option to sit at a table for two. Luxury liners such as Silversea and Regent will fill your wine glass for free, but generally you will pay extra for all alcoholic and carbonated beverages. 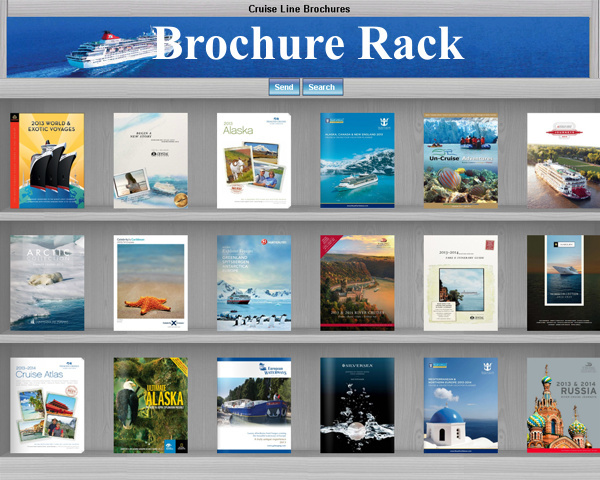 Browse through our expansive brochure rack, then call us to book your next adventure!